The MFA director reveals the secret to buying art and the one local he really hopes will come for a visit (hint: his initials are TB). 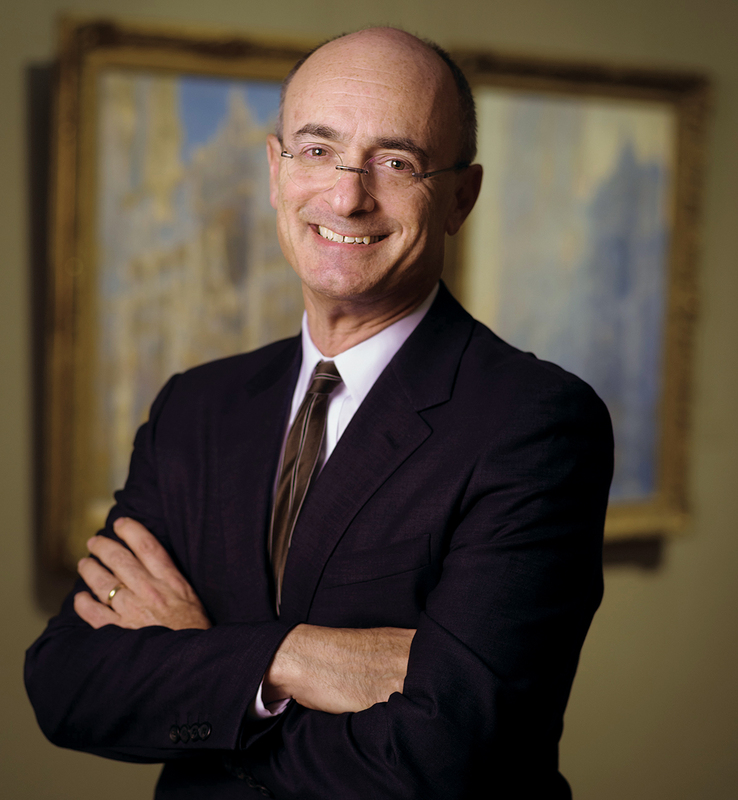 By Lisa Weidenfeld·	 10/8/2017, 5:59 a.m.
“I have to say the list would go on for a long time,” Matthew Teitelbaum says when asked to choose an artwork he likes to visit the most, and yet he has only a single piece of art hanging on the walls of his den at the Museum of Fine Arts. It’s a decidedly sparse and modern space for the head of the city’s most historical art museum, yet under Teitelbaum the MFA is in the midst of a renaissance: He’s doled out undisclosed millions for the first Frida Kahlo painting the artist ever sold, pioneered the museum’s new Late Nites, and is drawing more youth visitors than the organization has in years. In late summer, between sips of Diet Coke, the Canadian expat opened up about the perks and the challenges of leading the MFA—and about the lone portrait hanging in his office. I have to ask: Why this piece as your one office painting? That’s a portrait of Marsden Hartley, the great American artist, by Milton Avery, another great American artist. And, by the way, it has been in the galleries quite a bit, so it’s not something I keep privately in my office, although at the moment it’s here. And the reason I wanted it in my office was because it’s one artist expressing admiration for another artist. It’s the notion of legacy, and so Milton Avery here is tipping his hat to Marsden Hartley in that notion of American lineage. There’s something about having Marsden Hartley look at me every day that, I don’t know whether it gives me energy or exactly what it does, but it is inspiring. Will you swap the painting out at some point? Yes, I think I will. I wouldn’t mind seeing him in the galleries, but if you’re going to ask me what I’m going to put up in its place, I’m not yet sure. Probably not the Frida Kahlo. I think that would be a mistake. That would be a mistake for a whole range of reasons. You live nearby in Brookline. 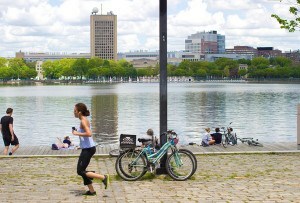 Do you walk or take the T to work? Or do you drive? I have only one excuse for driving. And I do drive, and it doesn’t take that long. I should probably walk, but—and you’re going to think I’m making this up—it does give me the opportunity to phone my mother. So if I go into work at a certain time and I know she’s up, I can phone her and we can have a conversation before I get here and I can feel virtuous and she can feel that I still love her and everything’s okay. My father was a painter, and so we grew up in a household where the act of making art wasn’t exotic. It wasn’t like, “Oh my God, that’s what they do, that’s not what we do.” So there wasn’t a big moment of understanding that art was something I could be part of. But I do remember going to an exhibition with my father when I was about 11. It was a Rembrandt exhibition, and we were leaving and he was saying that he was tired and had to go home. And I said, “What do you mean you’re tired? We just went to an exhibition.” And he said, “It’s hard work. Going to an exhibition is hard work. If you really want to get something out of it and if you’re really trying to figure out what the ‘it’ is, you have to make a real commitment.” I didn’t process it at a very high level, but I haven’t forgotten that. The museum recently announced a plan to give free family memberships to newly naturalized U.S. citizens. What exhibit in the MFA would you direct them to first? I’d be most interested in finding out from them what they gravitated toward, because I think one of the things that’s most important to emphasize is that any visitor belongs here and deserves to find art that relates to their experience and perhaps even expands their experience. And one of the great things about our program for newly naturalized Americans is that we’ll be welcoming people from all around the world. So for us to learn from them what actually resonates is quite meaningful. But since you want me to answer questions directly, I would take them to the Liberty Bowl, and I would ask them to think about what liberty means and what that bowl means both in an American historical sense, but also what it might mean to them. Is the program a response to the current political climate, or was it something you had wanted to do anyway? It’s based on a program I initiated [at the Art Gallery of Ontario] in Toronto, and it was based very much on the idea that a museum, if it functions in its truest sense, becomes a home. It has the attributes of welcome; it has the attributes of engagement. It’s like coming to a dinner party. So if a museum experience is somewhat like home, and if a newly naturalized American is making America their home, then how can I make a bridge between the two? Maybe an idea like that has a certain urgency or meaning in these moments, but it’s something that I think is deep in my thinking of what a museum is, and it’s deep in my thinking of what America is, which is a land of immigrants. Is it hard to be an outsider suddenly in charge of a 147-year-old Boston institution like the MFA? The whole question of change is the largest and most significant challenge for anybody entering a leadership position. And the challenge is that you’ve been brought in, to some degree, to create change. Maybe it’s not a revolution, but there’s an evolutionary aspect—you weren’t hired to make sure everything stays exactly the same. And then the question is, “Okay, how quickly do you make change?” One of the challenges is to make decisions at the right time. So this notion of “How do I make change and when do I make change?” is the big question for me. As an art curator, you’ve seen a lot of the world’s most famous pieces up close. Ever encounter anything unexpected? I had dinner with about 60 of my colleagues in the court around the David in Florence, Italy. And I looked at him—and of course he’s big and you’re looking up and it’s all pretty extraordinary—and you realize the scale was actually a communication of power and meaning and all the rest, which you don’t get in a reproduction. You see it in a book and think, okay, and then you’re there and it’s like 20 feet tall. But at the back of the David I saw this wire and I thought, why’s that wire stuck on his back leg? It turns out that it’s now wired because there’s a fault line in it and they’re worried about earthquakes, so they’re measuring on a constant basis whether or not the stone is splitting—which is fine, except that it affects the way in which you see this extraordinary figure because there’s this little blue wire sticking out of the back. What advice would you give to someone who wants to buy a piece of art but doesn’t know where to start? Jump in. I think we can all be a little too analytical and a little too fearful. There aren’t that many mistakes you can make if you trust your instincts and if you’re true to the things that excite you and connect you to something. So jump in. You worked at Boston’s Institute of Contemporary Art when it was still in its old location in the Back Bay. How does that experience differ from your time with a much larger, older institution like the MFA? I worked at the ICA when it was essentially an exhibiting hall. And we did exhibits, about six or eight a year, all with contemporary artists, drawing on no collection whatsoever, and I loved every minute of it. It was about taking risks, it was about communicating a certain urgency that artists felt about their time, and we did some pretty interesting projects that I still remember with an incredible sense of pleasure. And the ICA still does that. It still does extraordinary, urgent programming. It now has a permanent collection, it now has a new building, but it still has that frisky, energetic edge to it that maybe we have in certain areas, but wouldn’t be part of our DNA in the same way. We’re an older institution, we’re a bigger institution, and we represent many different things. And we can do something that very few museums in America can do, which is explore this notion of becoming a meeting place of world culture because our collections represent so many traditions and histories in the world. But how do we actually put those in dialogue with each other? And if we do that, how can we actually create the museum as a place where we can learn something about the world in which we live? So I’m interested in that big time, and to that degree, the ICA can do other things, but our historical collections allow us to do something else. If you could have witnessed firsthand any artistic movement, anytime, anywhere in the world, which would it have been? I would’ve liked to be in Giotto’s studio when he was painting. He was creating images around his religious beliefs in ways that were, in a new way, human. I would’ve liked that. I would’ve liked to watch Jackson Pollock paint. I would’ve liked to have been in Frank Lloyd Wright’s studio, listening to him teach. That would’ve interested me. I don’t know how I would’ve participated, but I would’ve liked to see how he created a language around his architecture, around his sense of creating space. What’s your guilty pleasure when it comes to pop culture? I don’t mind, even though my son won’t watch with me, a sort of schmaltzy romantic comedy. I shouldn’t actually say this out loud, but I’ve watched Notting Hill probably 10 times. And it used to be shown in Toronto on New Year’s, and my wife would say to me, “We’re not going to watch that again!” I’d say, “Well, we’ll just watch part of it,” and then we go through the whole thing and we watch it over again. I don’t mind a love story like that. That’s not really real life, but I like it. Does it ever feel like you’re competing with Tom Brady for Boston’s attention? I’m not in competition with Tom Brady. I lay down my sword and I say, “You are the master.” But I wouldn’t mind him coming to visit. Has he come to the MFA since you’ve been here? Maybe with a false mustache? Maybe with a false mustache. Or maybe early on a Sunday morning, when most of us are still in bed. But he is an icon of the city, and I believe that he should come to the MFA as often as he wants to. I think we got through this whole long list of questions that I had. But I didn’t say anything funny. And I know you wanted me to say something funny, and I didn’t. Do you want the funny question that I didn’t ask you? Well, the question might be funny, but is the answer going to be funny? Okay, here goes: As far as prominent Canadian artistic exports go, is Céline Dion the bigger name, or has Justin Bieber finally eclipsed her? I don’t know what it’ll do for my brand, but I’m not a Bieber guy. There’s an elegance to Céline Dion that I respect. And she has a real voice. The “but” is that I’d rather listen to Neil Young. So if you’re going down the Canadian route, you might get me listening to Neil Young before anybody else, but I’m not a Bieber guy.